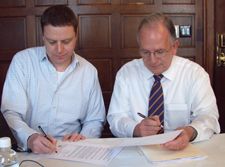 Jason Wilde, left (publishing director, Nature Publishing Group, and chairman of the InChI Trust Board), and Terry Renner (IUPAC executive director) at the InChI Trust signing on 21 March 2010. At the third meeting of the InChITrust Board of Directors, in San Francisco, USA, on 21 March 2010, an agreement (see text below) between IUPAC and the InChI Trust was signed by Jason Wilde (publishing director, Nature Publishing Group, and chairman of the InChI Trust Board) and Terry Renner (IUPAC executive director). This sets out the conditions under which the two organizations intend to further develop and maintain the International Chemical Identifier (InChI). The diagram below explains how the relationship will work. further development require intricate consideration by various groups; here is how, schematically, the organizations and individuals involved with InChI interact. The InChI Trust, established in May 2009, provides a means of continuing the development and maintenance of the InChI standard with funds from annual membership dues. The IUPAC Division VIII InChI Subcommittee (hereinafter called the “IUPAC InChI Subcommittee”) represents IUPAC’s authority for recognition of the InChI standard. The InChI Trust Board of Directors includes a IUPAC representative with full voting rights. Requests for changes, whether corrections or extensions, to the InChI algorithm and/or the related InChIKey hash algorithm can arise from InChI Trust members or other InChI users, or from within IUPAC. The IUPAC InChI Subcommittee and the InChI Trust Project Director will consider any requests for change, define corresponding requirements and communicate these requirements to the InChI Trust with suggestions for prioritization if necessary. 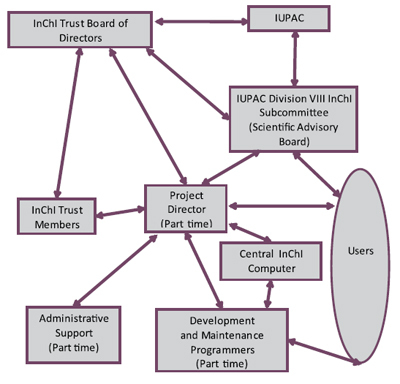 The InChI Trust will make arrangements for work needed to implement accepted changes, discussing any prioritization issues with the IUPAC InChI Subcommittee. In case of disagreement over priorities, the Trust, as provider of funds for the work, will have the final say. However, it is open to IUPAC to provide alternative sources of funding for any work connected with InChI development. Conversely, the Trust may contribute funding towards projects of the IUPAC InChI Subcommittee. Any new (corrected/extended) version of InChI/InChIKey will require IUPAC approval (i.e. endorsement by IUPAC Division VIII) before release. New versions of InChI/InChIKey will be released simultaneously on the IUPAC and the InChI Trust websites. All releases of InChI algorithm will be on behalf of IUPAC and the InChI Trust (as joint licenser) and will continue to be made available under the GNU Lesser General Public License version 2.1, or other open-source license as mutually agreed between IUPAC and the InChI Trust. Questions about the Trust should be routed to the project director, Stephen Heller <Steve@InChI-Trust.org>, or to the IUPAC Division VIII InChI Subcommittee and InChI Trust Secretary, Alan McNaught <mcnaught@ntlworld.com>.